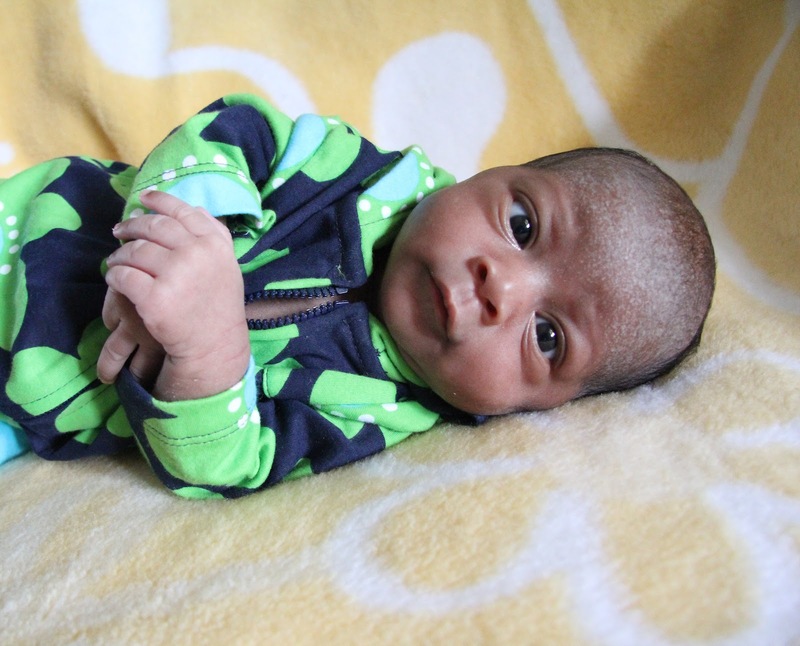 Important announcement: Babies have arrived at the El Roi Baby Home on Project Canaan! It was Easter morning in 2003 that I first witnessed the rescue of a child who lived on the streets of Lusaka, Zambia. It was an earth-shattering, life-changing event that changed the entire trajectory of my life. I saw hope in the face of six year old boy named Kantwa, as he said goodbye to the filth, the terror and the hopelessness of life as a “street kid”. It may have been in that moment that I first truly understood the power of the resurrected Jesus, and it was Easter morning. It is now the week before Easter 2012 and I am overwhelmed as I reflect on all at all that has happened in the past nine years. I have experienced intense pain at the death of children I love in Africa and I have cried a thousand tears and wondered if they would ever end. But I have also see miracles with my own eyes, seen buildings built, funding appear from the most unexpected places and felt the hand of God on my life in a palpable way. 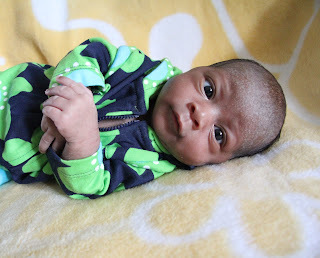 But today I am writing to tell you of a new story of hope and it comes with the news that the El Roi Baby Home on Project Canaan, in the tiny Kingdom of Swaziland, is now open. El Roi is the Hebrew name for “The God Who Sees” (read Genesis 16:13) and we know that He sees the babies who are being directed to us just as He sees you and me. 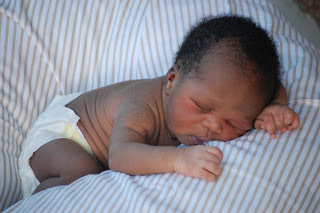 In late February 2012 we opened our doors and wondered when, how and even IF any babies would be brought to the El Roi Baby home. Swaziland has the highest HIV/AIDS infection rate in the world and this murderous and relentless pandemic has a left a wake of orphans and vulnerable children. It has also left women (often young girls) with a feeling of utter hopelessness that results in them “dumping” or abandoning their new born babies because they have to possible way to care for them. On March 1st, 2012 our first newborn baby arrived. Please allow me to introduce you to the newest members of our family and of the El Roi Baby Home. Baby #1: Joshua was a three-day-old baby boy was brought to us because his mother couldn’t care for him and had planned to “dump” him as soon as he was born. The child’s father had been murdered months prior to the baby’s birth and a caring Social Worker convinced the mother to bring the child to life safely and she would help find him a home. El Roi is his new home. 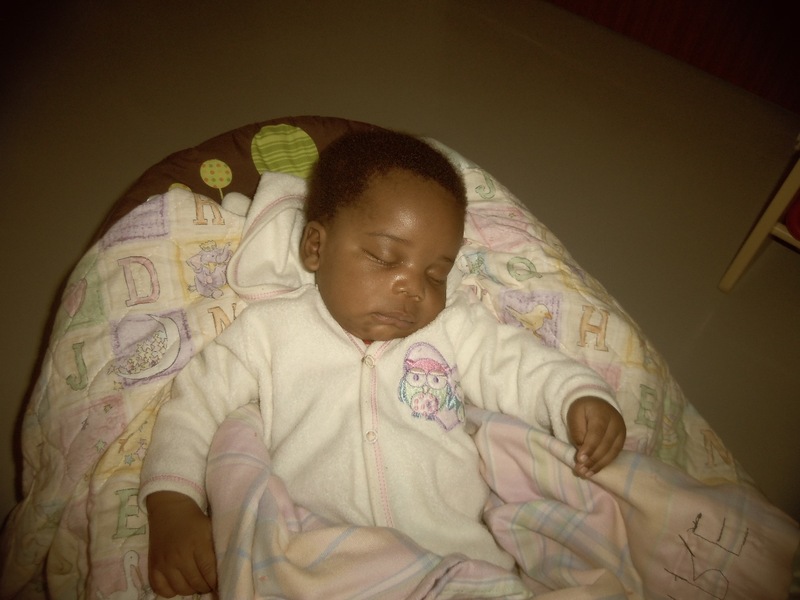 Baby #2: – Esther was a 14-day old baby girl who arrived a couple of days after Joshua. Esther’s mother was young and planned to commit suicide in her eighth month of pregnancy. Again, a caring (and life-saving) Social Worker convinced her to save her own life and the life of the baby. The baby was abandoned at the door of a man who delivered the child to a local hospital. The mother is HIV positive and Esther was treated as soon as she was born. We will know in a few weeks whether she is HIV positive as well, and what her future care needs will be. El Roi is now the home for this little girl. Baby #3: Caleb is a baby boy and is 8 months old and only weighs 12.3 pounds. 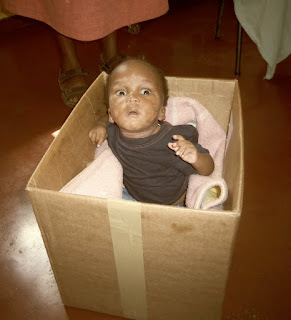 Fortune was delivered to a local hospital in a cardboard box, by his father who is in the final stages of HIV/AIDS. His mother had already succumbed to the disease and the father was no longer able to care for him. Fortune is HIV positive and is being treated with ARV’s. He has active Tuberculosis and is covered in terrible sores and lesions. If that wasn’t enough for this little guy, he is severely malnourished and is struggling to survive. El Roi is now his home. Baby #4: Levi arrived TODAY (March 29, 2012) and is 8 weeks old. His mother was raped in South Africa and as a result is HIV positive and while she does not want to have anything to do with the child, the Social Worker encouraged the mother to care for the baby for a time to see if she would change her mind. Today she brought the baby to the hospital and left him there. El Roi is now his home. Baby #5: Anna is a baby girl, is a month old and has been living in a government hospital since she was found in a pit latrine (outhouse/toilet) just after she was born. She has been struggling with a chest infection since then and getting treatment in the hospital. While she has not arrived at El Roi yet, we are praying that she will be released to our care in the hours/days ahead and El Roi will be her home. As you can see we have much to be thankful for and much to pray for. The emotional and physical cost to care for these babies is high. Please join us in praying for Helen Mulli and the others who have been hired to provide 24 hour care at the El Roi Baby home. As some of you may know, Helen was rescued by Mr. Charles Mulli at the tender age of eight-years old and was raised by Mr. & Mrs. Mulli at the Mulli Children’s Family Home in Kenya. She has grown to be a wonderful woman of God, married Peter Mulli (Charles’ youngest brother, and Kaleli’s Uncle) and is now living at the El Roi Baby Home to care for “the abandoned and ignored” babies who are brought to us. As you would expect there is also a high financial cost to care for these babies so that they get proper and immediate health care, the right nutrition for their situation and all the love that can be poured on them. Currently we only have 6 people helping on a monthly basis and are asking if you would consider becoming a Heart for Africa HERO by committing to a monthly donation to support the El Roi Baby Home. It is as simple as clicking here and signing up today. This has been a long read, but I hope that you are inspired by it and will join me in prayer and thanksgiving to the Lord who is the giver of life, and to El Roi, the one who SEES us all. Thank you also to Annie Duguid, from the Watoto Baby Home in Uganda, who came to Swaziland to help prepare the El Roi team to be ready to receive babies (including hiring and training women who will love and care for these children). We are thankful for the leadership team at Watoto who invested in the El Roi Baby Home by giving Annie six weeks of paid leave to come and serve with us. Thank you to our Staff at Heart for Africa and on Project Canaan and to our Board of Directors in the US and Canada who have stood by us through the highs and lows as we have prepared the way for the little ones to arrive. Happy Easter everyone! He has risen indeed! Moving to the US in October 2006 seemed like a bigger thing than moving to Africa. The move from our home in Aurora, Ontario was traumatic on so many fronts. It was the home that we designed and loved. It was perfect in our eyes. We had a big piece of land, large gardens, a fabulous custom designed pool and great neighbors who were Chinese, Spanish, Italian, Indian and just a few WASPS. The hospital the children were born in was close by and everything they knew was right there. Healthcare was free, my cousin was our dentist, the restaurants were diverse and my mom was just down the road. Our community was very safe and the small private school the kids attended was lovely. We were happy (well, content might be a better word). We were certainly COMFORTABLE with what and who we knew. Moving to Atlanta was crazy because we didn't know anybody, we had no friends here, AND worse, we were heading south to be in full time ministry, which was WAY out of our comfort zone. But God is faithful and He connected our family quickly and for 5 1/2 years this has been home. 79 days from today the Maxwell family will be driving to the Atlanta airport and getting on a plane. This blog is just an update on where we are in the process, just in case anybody cares. Our house in Alpharetta is on the market now, but we haven't had anyone come through and see it yet. We are in the process of building a house on Project Canaan in Swaziland and it is coming along nicely. Above is a photo of the house and the view from the front porch The doors and windows are in, the view is great and the electric/security fencing will be going in soon. There is lots of landscaping to do, which is critical to try to encourage all the neighborhood poisonous snakes to relocate. Landscaping will also remove of all the marijuana plants that seem to have cropped up wild all around our house. Sheesh. I maybe should be feeling panic, but I am not. I have peace about our impending move and our new lives. I found out today that I will have to iron ALL our clothes that dry outside (too expensive to run the dryer except during rainy season) because of grass tics and itch bugs that might be living on your clothes when you bring them back inside. We don't have a water filtration system installed yet for any domestic use, but that too is underway. We have started our Typhoid pills just in case of an outbreak - strange to have to take a live virus in a series of four pills over eight days to prevent possible illness. I am so thankful that malaria is not an issue where we are living so we don't have that to deal with. I have gone through every drawer, every closet, every room and have purged to the best of my ability. The way I look at it is we now live in a three story home and are moving to a one story home. Simple math suggests that we need to eliminate two thirds of all the stuff we own. Slowly it is going away and I am not missing any of it. We will ship the first half of our belongings on April 4th so they are there when we arrive on June 2nd. The other half ships on May 31st as we get on the plane. A few things that are still to be done: sell the house, drive our 2 Canadian cars up to Canada to sell them because we can't sell them here, determine what University Spencer will attend, find someone to take our 2 beautiful Bengal Tiger house cats, Chloe's 16th birthday party, Spencer's 18th birthday party, pack 2 containers, change of address notifications, get new Canadian passports for the family (they expire soon - not good) and a long "to do list" of miscellaneous items. I have a bit more travel to do before we leave. In fact I have 14 more flights before I get on a plane to fly to Africa. Now I'm not complaining because I have an awesome month ahead with some awesome speaking engagements (Hawaii, Venice Italy, Las Vegas, Edmonton Alberta), but I look forward to the month of May when I am home in Atlanta for our last month. We left the comfort of "home" in Canada to settle in the "land of the free and home of the brave". It has been an interesting time here in the sunny south and we are thankful for our time here. But it is time to move on. We really don't know what to expect when we get to Swaziland other than change, challenges and joy. What we do know is that God is with us every step of this journey and we feel His presence every single day. For that we are thankful. Without His presence, this would just be a bad idea. Thanks for your prayers and support and for reading all the way to the bottom. Happy Tuesday!